With a new version of Firefox recently released I thought it was well time that I recap on this fantastic browser as far too many people are still using what I would consider to be the inferior Microsoft designed Internet Explorer. Tabbed Browsing – This allows you to only have one browser open but with multiple tabs (pages) that you can then switch between quickly and easily.This leaves your taskbar a lot less cluttered than having multiple instances of the same browser running simultaneously. Downloads Manager – Rather than downloading software to a selected location on your hard drive you can use Firefox to manage all of your downloads in the same place.Should you choose to then save a download permanently onto your hard disk this is quick and easy to do. Pop Up Stopper – A fantastic feature that has only recently been added to Internet Explorer.The Firefox pop up stopper does exactly what it says on the tin as it simply stops intrusive pop-ups from getting in the way of your browsing experience. Simplicity – This browser is extremely compact and simple – We have no flashy graphics or fancy menus to contend with which ultimately makes the software easier and quicker to use. First off it is worthwhile noting that the software hasn’t bloated and all and as such is still a tiny 5mb download whereas IE 6 can be up to 75mb in size.Now only does this make the software extremely quick to load and use but due to some new intelligent caching the performance of moving from page to page has also been improved. The tabbed browsing interface has been improved so that you can now change the order in which you flick between pages from within the software.Whilst a small improvement on paper this does really improve the usability of the software. 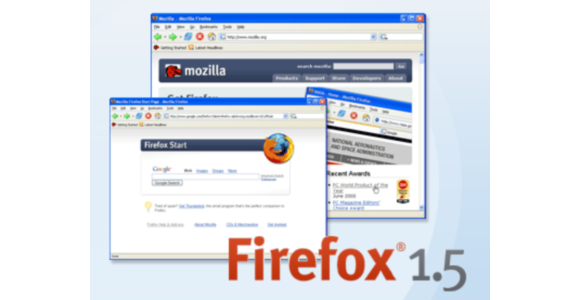 Possibly the most important feature is that Firefox will keep itself secure by automatically updating should a security hole be found.For example should a security vulnerability be found in the software the developers of the package will be able to make the browser automatically update without the user even being aware. The way in which third party additions to the software are managed has also been changed which will mean that many of the older extensions designed for previous versions of Firefox may not work however you can rest assured that you won’t have to wait long for an updated version to hit the public domain.Since we’re now on the subject of extensions can I suggest that along with the basic browser that you download the Google Toolbar (http://toolbar.google.com/firefox/) as this provides several improvements to Firefox including an auto form fill utility and a spell checker which is especially useful to those that use web based e-mail programs.As one may expect the Google Toolbar also includes the ability to use the Google search engine and news services from within the toolbar without having to actually visit their website. The Firefox browser has already captured approximately 10% of the browser market which is extremely impressive when you think that not only is Internet Explorer included with every version of Windows but also that Microsoft have a huge amount of resources available to them to develop their browser.I certainly prefer Firefox over Internet Explorer and would recommend that you at least give it a trial run by visiting www.firefox.com.